The first full day out of Tennessee, June 2, I stayed in Abingdon, Virginia, at the Jubilee Retreat Center, which is run by the Catholic Church. I highly recommend looking for such retreats–they are in beautiful places, they are quiet, and they are relatively cheap, all things that I value greatly. From this dream, I woke up in Abingdon, but too late to catch the van for White Top. I drove east to Damascus, where I had been assured there were seven bike shops and surely one would take a lorn senior lady biker up the mountain, but regrettably, none would. 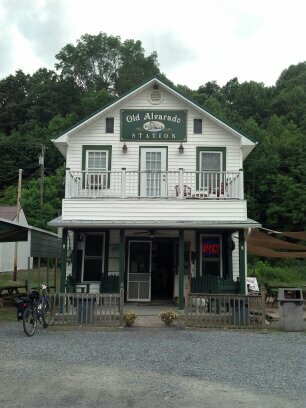 So I decided to bike back westward along the river back toward Abingdon and forget about the mountain. The bike trail hugs the river, and it’s very quiet. I passed only a family of four and a couple of other bikers in about 14 miles of biking. I wasn’t in Tennessee anymore. Big smile got bigger. Storm clouds had been threatening all day, but until Alvarado there had been no rain for me. I liked the relatively cool air and the shade of the path. Refreshed by my tea and my rest, I decided to turn back to Damascus. In the Christian Bible, in the Book of Acts, the story is told that a man named Saul who was traveling to Damascus, Syria, in order to persecute Christians there, was blinded by a brilliant light from Heaven; as he lay on the road, a voice asked him, “Saul, Saul, Why do you persecute me?” and he was told to go on to Damascus. Blind, he did so with the help of the men traveling with him. In Damascus, he was cured of his blindness, took the name Paul, and became an apostle, one of the key figures, of the infant Church. Even today, to be “on the road to Damascus” means to experience a “sudden and/or radical conversion of thought or a change of heart or mind, even in matters outside of a Christian context,” according to Wikipedia. I wouldn’t say that my road to Damascus was a moment of conversion, but it was a moment of version, of turning toward something different. Just about five minutes out from Alvarado, it started to rain. I had a green rain jacket, which I donned but then couldn’t figure out how to cover my helmet with; the hood kept falling halfway down my nose and I kept hitching it back up. 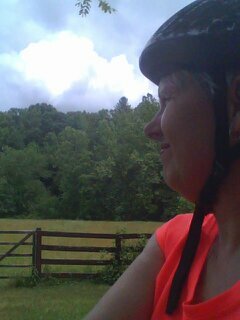 The rain fell and soaked my black culotte pants, but the path didn’t get muddy and lightning didn’t strike, and it wasn’t cold at all, so I biked back to Damascus, wet and slippery as a new-caught fish, but tired, peaceful, and happy, as if held in some great light of my own. The bed felt very soft that night, and I did not dream. Thanks, Mustafa! I’m working on trying to get it all into some kind of perspective. How wonderful it is to read your observations and memories of observations. Your photos also add another dimension to this trip. I, too, am looking forward to reading, seeing a more complete version from start to finish.